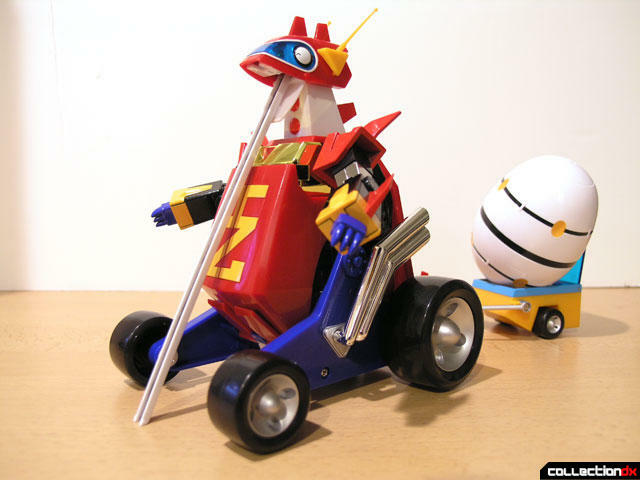 Gyakuten-Oh (逆転王) comes from the series Time Bokan Series Sudden Change Ippatsuman (タイムボカンシリーズ逆転イッパツマン), an animated television series by Tatsunoko that aired in Japan from 1982-1983. 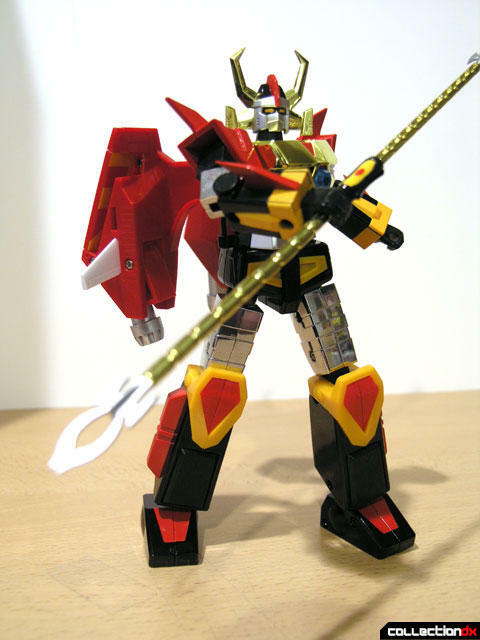 The original toys are classic examples of Japanese toys of the time and were produced by the legendary Takatoku Toys (who also created early Macross and Orguss toys). Not including gashapon or trading figures, the last toy from Ippatsuman appeared in 1982. 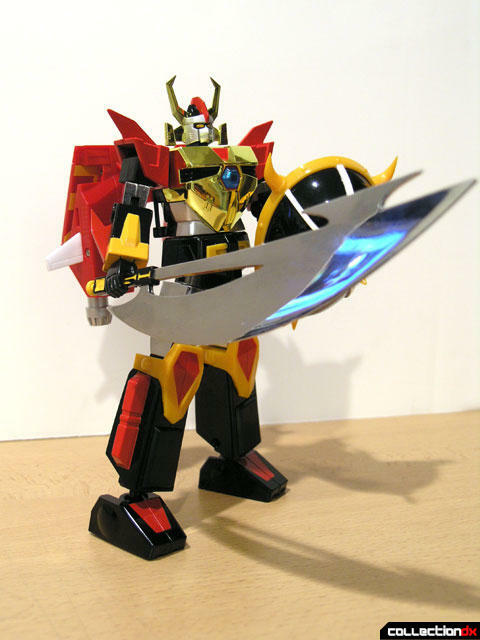 Now, 25 years later, CM’s Corporation brings us the remarkable Brave Gokin Gyakuten-Oh. Click here to skip to the video review. Gyakuten-Oh is a really really nice toy. 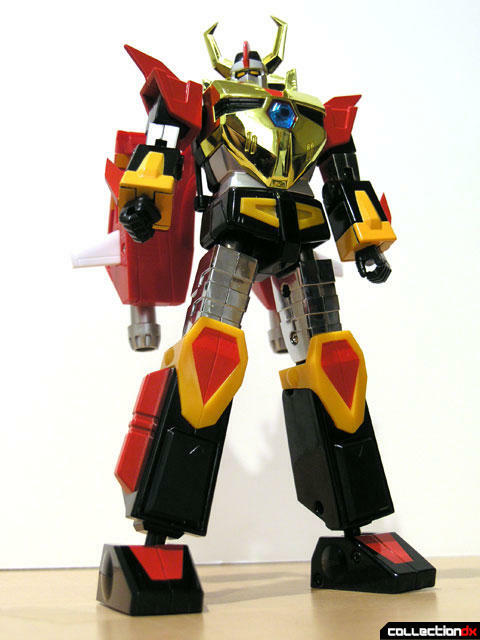 This is the second “Vintage style” Brave Gokin toy CM’s has done, and it lives up to the quality of its predecessor, Goshogun. The toy comes in a much larger box than Goshogun due to all of the accessories included. The tray is old-school Styrofoam, and each piece is wrapped in plastic. The whole trend of putting plastic sheets between the toy and the Styrofoam irks me a little – it ruins the “vintage” feel. The main components are embedded in the front while the smaller accessories are stored in a tray in the back. Gyakuten-Oh is a chunk of die cast love. It is mostly metal, save for the hands, head, and wings. It clicks in all the right places, and feels great in your hand. The cold metal is reassuring to the touch. 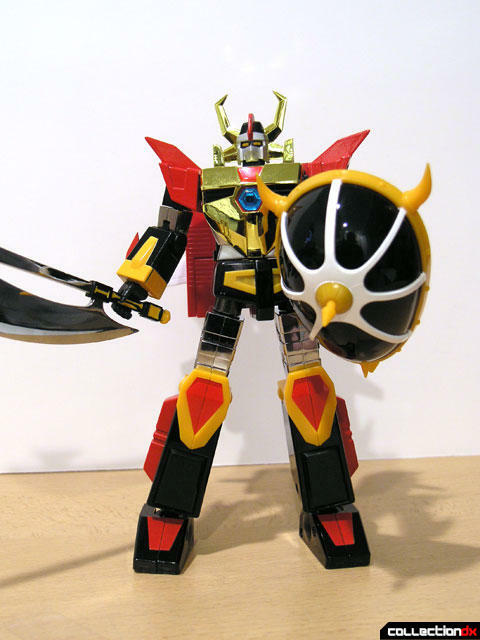 The hands can be swapped out with a number of accessory hands and can hold a variety of weapons including 2 large spears, sword and shield. 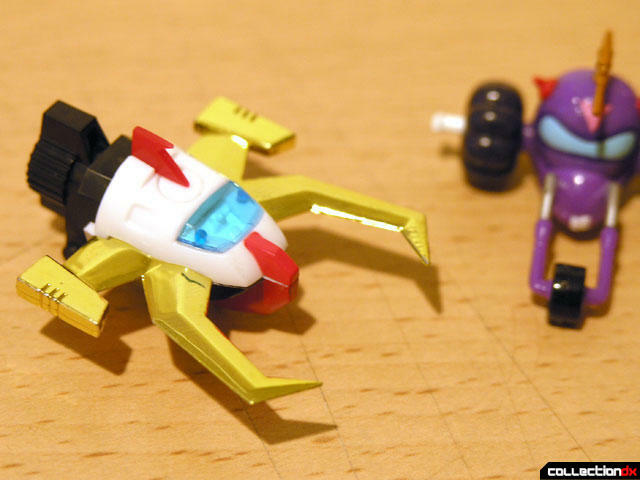 The arms and hands are designed with a gimmick that allows you to replace the hand with a claw for the combined toy. Two panels on the forearm open, and you can rotate the fist inside of the arm to reveal the blue claw hand. Unfortunately, this joint is much too tight, and trying to turn it results in you popping off the hand. It is best to swap the hand and forget about this gimmick. Gyakuten-Oh must be first folded up to fit inside the shell of the Tokyu Zaurus. First you remove the head, and then you move the shoulders up and out of the way. The back sections slide down and swing around front, reversing the front panels in the process. The arms then go back down to the side and the hands are swapped out with the claws. 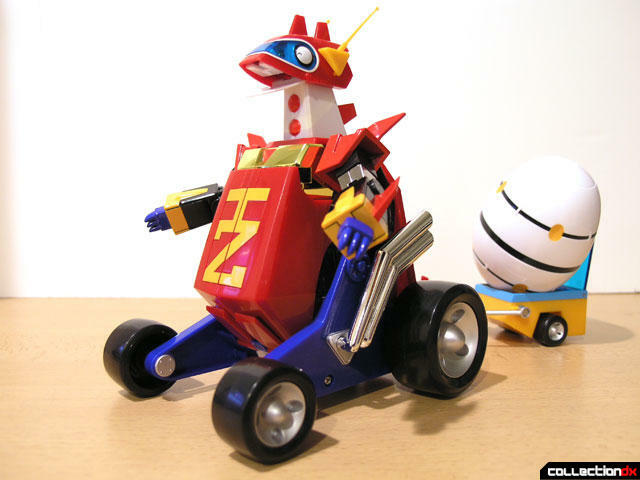 Then finally the legs get bent up around the back and the whole unit snaps into the open Tokyu Zaurus. The yellow knee guards fit into a slot at the bottom and the top plate snaps into where the head was. The combined unit is goofy, but that is what this show was about. 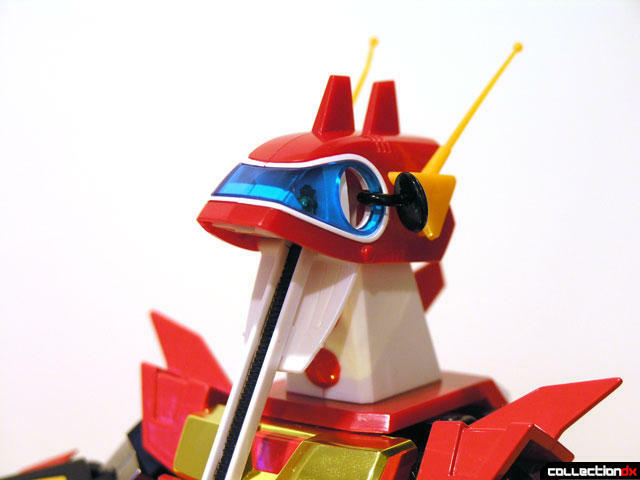 In this mode the Tokyu Zaurus’ head can move a bit, the mouth can open (where you can attach a long set of stairs) and if you press one of the horns the eyes on the side of the cockpit open, revealing pilots inside. The toy also comes with a trailer called the Cargo Unit. This too is all plastic, and features a translucent blue plastic cover, which can open to store the giant egg. 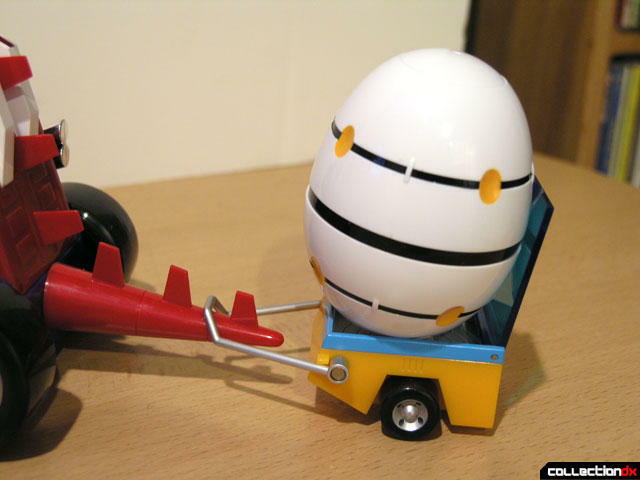 The egg can separate into two parts, but as I have never seen the show, I have no idea what it is for. When not being towed behind the Tokyu Zaurus, it can be stored inside of it in Relief Don mode. 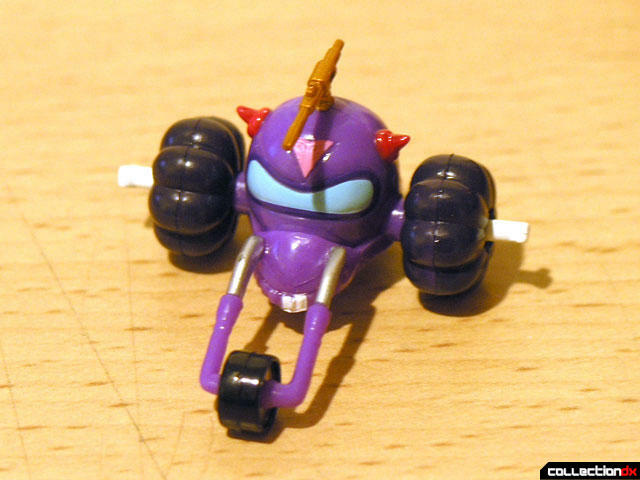 When combined, the head becomes its own ship called the Dangan Head (弾丸ヘッド), and also included is a small vehicle called the Sharekoube Buggy (シャレコーベバギー). The buggy can be separated into two parts. So everything is great about this right? It’s neat looking, has lots of great features, but there were a surprisingly large number of things that I think they could have done better. The Head – The head looks great, but turn it and it pops off. The connection here is a ball joint and it is just too small. When you remove the head for it to be a separate vehicle, the peg assembly should come with it, but I find unless you move it just so, the connector stays in the body. 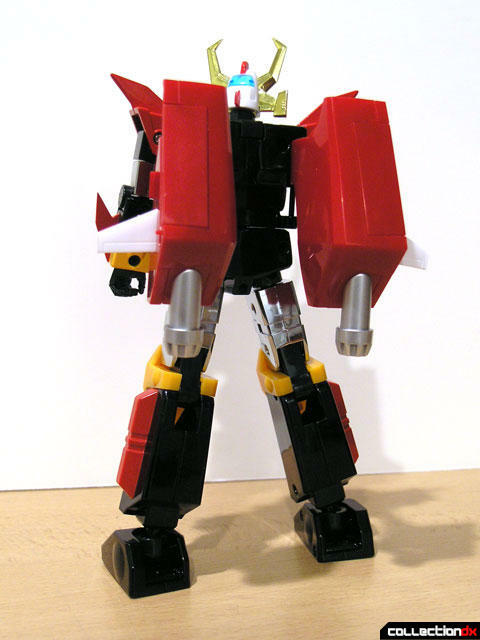 The Hands – The whole gimmick with the hands and the rotating posts into the forearm are poorly done. You are better off just removing and replacing the hands than deal with this issue. The Tokyu Zaurus – While it looks neat, it feels surprisingly cheap. It would have been great to have even a little bit of metal to this toy, and maybe rubber tires. The Price – This thing is very expensive. Japanese retail price is 20,790 yen. That comes out to about $180.00 USD. Organic Hobby plans to release this to the US market at about $230.00. That’s insane. I mean, it is a great toy, but is it a $230 toy? I guess that is up to what it is worth to you. Maybe at $150 it would be a bit more reasonable but I think most of the buying public is going to scoff at the price. I recommend getting at Japanese retail through HLJ and even with shipping it still comes out less than the US price. Regardless of the price, it still is a nice piece. A few flaws but nothing earth shattering. Let’s hope CM’s works out the bugs on the next piece, the Sankan-Oh. That looks great and I'd love to grab one, but it's just too expensive. I could see about $150 tops, for me. I mean, you mentioned Iron Gear in the review and THAT was only about $150. Is this better than Iron Gear?! I seriously doubt it. "This must be settled the way nature intended....with a vicious, bloody fight!" While I agree that the price is too high, I'm glad that the Brave Gokin line is continuing to feature more "classic" robots. 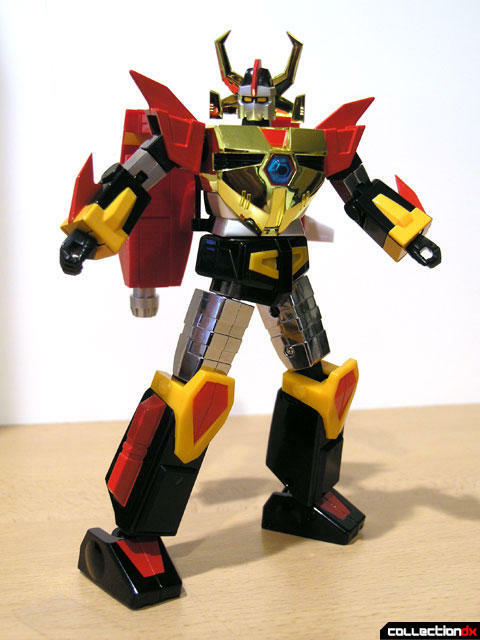 It's really nice seeing a new metal toy that isn't a Mazinger.